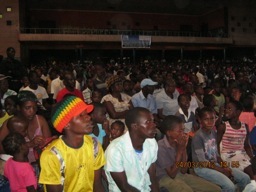 MORE than 2000 people learned about their politicians’ failure to keep promises to the poor made in 2000 – during a musical event. Micah Challenge, joined with local churches in Mutare, eastern Zimbabwe, to host a musical concert that helped highlight the plight of the poorest people in the nation. Organisers staged the event to make locals aware of the Millennium Development Goals (MDGs) - promises made in 2000 to halve poverty indicators like hunger, maternal and infant deaths, lack of clean water and sanitation and preventable diseases. The event was held amid fears that the country is unlikely to eradicate extreme poverty and hunger by the MDG deadline of 2015. MDGs are an eight-point roadmap with measurable targets and clear timelines for improving the lives of the world's poorest people, agreed on at the United Nations General Assembly in September 2000 by 189 world leaders. But nations, such as Zimbabwe, are lagging behind on many of the indicators.